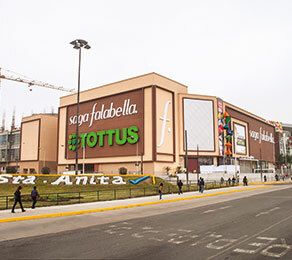 Santa Anita Mall is one of the biggest malls to be constructed in Lima, Peru. It covers an area of 200,000 m2 and was constructed as the economic growth of the country increased and demand for retail activity grew. CCL installed its XF10 and XF20 post-tensioning systems on the mall, one of 20 in Peru being built between 2011 and 2013. The company was asked to accommodate large spans and provide a cost-effective solution. In response to the structural requirement for long spans, CCL installed post-tensioned band beams in one direction and 200 mm-deep post-tensioned slabs in the other, achieving spans of 9m and 15 m. The band beams were able to accommodate the large spans and post-tensioned slabs above. The CCL solution reduced the cost of the original reinforced concrete design. During the construction process a number of design changes were required, which were completed promptly by CCL design engineers - demonstrating their flexibility and ability to meet the needs of the client.